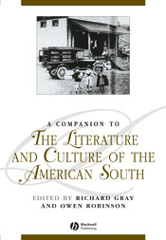 From slave narratives to the Civil War, and from country music to Southern sport, this Companion is the definitive guide to the literature and culture of the American South. Includes discussion of the visual arts, music, society, history, and politics in the region. Combines treatment of major literary works and historical events with a survey of broader themes, movements and issues. Explores the work of Edgar Allan Poe, Mark Twain, William Faulkner, Zora Neale Huston, Flannery O'Connor and Eudora Welty, as well as those - black and white, male and female - who are writing now.